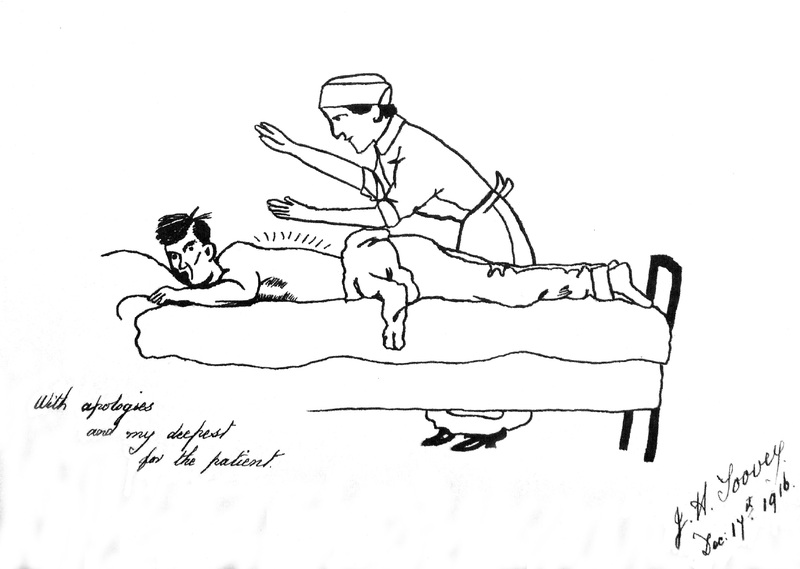 The techniques of massage and physiotherapy treatments formed a crucial part of nursing care during the First World War. Treatments were developed for mind and body, and treated shell shock and nerve damage. The Society of Trained Masseurs had been established in 1894, and in 1914 Almeric Paget and his wife founded the Almeric Paget Massage Corps (APMC). Masseurs treated between 30 and 40 patients a day, using massage, hydrotherapy and electrotherapy. By the summer of 1915 the APMC masseurs were working in 110 military hospitals. The Beaufort specialised in orthopaedic injuries and massage was an important part of the treatment. Although we have not had any luck with medical records, our research has uncovered several references to masseurs at the hospital. The Red Cross archives hold the original card index of all VADs (Voluntary Aid Detachment Nurses). Miss Edith Hemingway from Stoke Bishop in Bristol is listed as working at Beaufort as a masseur, paid £1 7s 6d a week. Her card records that she had nine months training in massage, and a further fortnight of training in electrical treatments. The museum has an electric massage machine similar to those that were used in the First World War. We also have our autograph books which both belonged to masseurs who worked at Beaufort, Miss Williams and Miss Witts. Contributions from patients include drawings and poems sometimes reflecting the dread of treatment, but usually reflecting a sure affection for those who delivered it.